Good Evening Everyone! It is to me the saddest regret that this will be the last Weekly FOLD by me. It has been an amazing year of learning and creating models as a Paper Engineer part of the Executive Team of 2012-2013. Now as I will be moving on to a new position within F.O.L.D., I encourage all of you to apply for the position of Paper Engineer in the upcoming Fall Election in September 2013. I truly believe that whoever that will takeover my position will do just as a fine job as me if not better (*fingers crossed*). 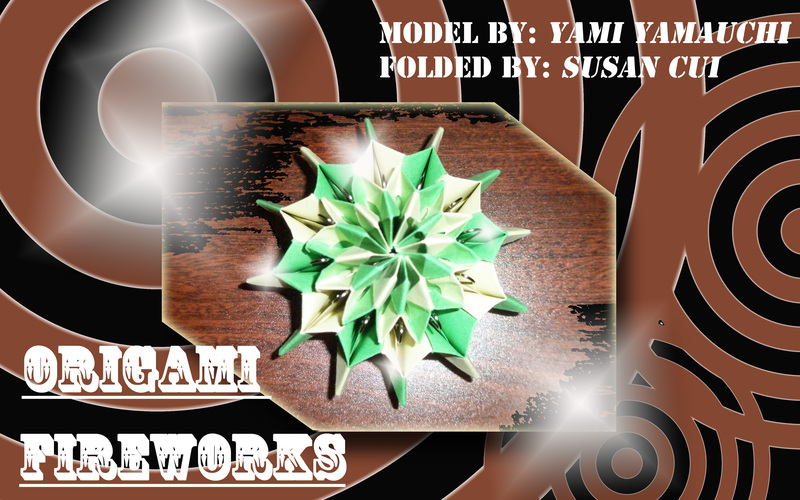 For this last edition of Weekly FOLD of the year, I chose the “Origami Fireworks” model by Yami Yamauchi. I put in a bit of my self-invention from the addition of the medal paper clips to keep the model in a fixed shape as oppose to the original versatile model. For those of you that are interested, here is the video instructions http://www.youtube.com/watch?v=z0-mlZvJD-E .